This is how it all began: the first thirteen episodes of a series that would still be running more than forty years later. 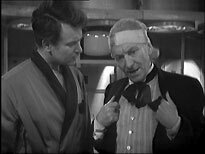 The series begins with An Unearthly Child, when two school teachers are transported, against their will, in a time machine, back into prehistory. 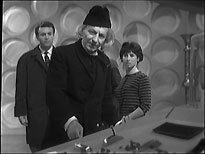 The machine is operated by a cantankerous old man, known only as The Doctor, who is apparently the grandfather of one of the pupils, Susan Foreman. The first episode of Doctor Who is a television masterpiece, brimming with atmosphere, intrigue and potential. It brilliantly introduces the show's key characters, and concisely sets up the entire premise of the series. It's more or less self-contained (although, as is now tradition, it ends on a cliffhanger). If Doctor Who had ended production after that episode or, heaven forbid, the rest of the series had been wiped by the BBC, it would still stand up as a classic piece of television drama. The rest of the story, the part that finds the TARDIS team on prehistoric Earth, and pitted against a tribe of cavemen, is relatively mundane, but must have seemed quite magical in 1963. 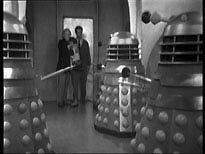 The second story, The Daleks, finds the time travellers on an alien planet, apparently after a nuclear holocaust has wiped out all life. 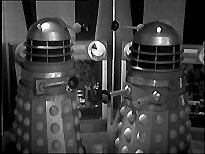 They find themselves stranded, in need of a piece of equipment to repair their ship, and soon fall into the hands - er, suckers - of a group of hate-filled robotic aliens: the Daleks. Over the course of seven episodes, the Doctor encounters a second group of aliens, the pacifistic Thals, and attempts a reconciliation between the two races. The story is part morality tale, and part Boys Own Adventure pot-boiler, featuring, as it does, a perilous trek across uncharted hostile terrain. The third story, The Edge of Destruction, is set entirely within the TARDIS, and begins with the occupants waking up suffering from amnesia. Suspicions and tempers rise, as the characters struggle to discover what has happened to them. As so-called "bottle shows" go, it's an interesting, Pinter-esque adventure, which reveals tantalising hints about the Doctor's past, and develops the characters to the point where they begin to trust each other. Early Doctor Who has a reputation, even among its fans, for being clunky, but on the evidence provided by this set, that's rather unfair. It is true that the show's ambition often exceeds its grasp, but there's plenty to keep a modern audience entertained. It's certainly admirable, given the conditions under which it was made. Although it was pre-recorded, it was essentially recorded live, with few opportunities for more than one take. It's doubtful that many of today's actors could cope with the pressure of learning a new twenty-five minute script, to be performed without a break, each week! There's no evidence in these early episodes that the show's special effects were at all lacking. In fact, they seem incredibly ingenious, using traditional film techniques, like model work and matte paintings, as well as relatively complex electronic video techniques. This set splits the three featured stories across three discs. The first includes the Pilot episode (in both its raw form, and the edited version), and the four-part story An Unearthly Child; the second features the seven episodes of The Daleks; and the third features the two-part story The Edge of Destruction . Presentation of the disc content uses the usual template that will be immediately familiar to anyone who has ever used another Region 2 Doctor Who DVD. There are a couple of nice touches, including a nice title screen for each story. 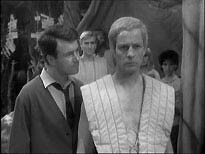 All the episodes were sourced from film recordings of the original black-and-white videotapes (for more information about this process, see Early Doctor Who on DVD - An Introduction). 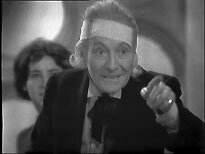 The episodes have been newly-transferred from the original film elements (usually 16mm negatives), and extensively restored using digital jiggery-pokery (a detailed article about this is available at the Doctor Who Restoration Team's website). All the episodes have been processed by the VidFIRE technique (also described in the Early Doctor Who on DVD article), which restores the episodes' original video picture quality. This collection used an improved version of VidFIRE which has been used on the BBC's award-winning Quatermass Collection DVD set, and on the Doctor Who DVD The Web Planet. The episodes generally look and sound very impressive. The first episode - a television landmark - is, unfortunately, probably the worst of the thirteen included in the set. It's always looked very murky (and, certainly, a lot worse than it looks here). Most of the other episodes are appreciably clearer. There are rough patches in one or two of them, but they're all much better than anyone has the right to expect forty-year-old BBC recordings to be. The improved telecine transfers and the VidFIRE processing has revitalised them. Additionally, extensive work has also cleaned up dirt, scratches and other undesirable film wear-and-tear related detritus. Fans of this era of the programme will be thrilled with the efforts of the Restoration Team. More casual viewers, perhaps simply curious to see how the programme began, will be oblivious of their endeavours, but won't have to contend with the potentially off-putting patina of dirt that might distance them from the material. All thirteen episodes, and all the bonus material, except the commentary tracks, have optional English subtitles. The Doctor Who Restoration Team continue to walk a fine line between care-taking and excessive tampering. Happily there's little about this release to rattle the purists (and I proudly include myself among their number). There are two versions of the Pilot episode presented in this set. The first is the unedited raw Pilot Episode Studio Recording (accessible through the Special Features menu). This is a thirty-five minute version of the episode. It features a second attempt at recording the final third of the programme (all the scenes inside the TARDIS), because of technical problems (most notably the continual banging of the TARDIS doors). The second presentation, which is presented as it would have been if it had been edited for transmission, has received a no-holds-barred cleanup, with technical errors, editing screw-ups, and even mistakes made by the actors corrected. Since the complete studio recording is also available on the disc, I have no issue with this revisionism (especially as the programme was never transmitted as part of the series, anyway). The "improved" presentation is most welcome, but I can't foresee any situation where I might want to watch it in preference to the unedited raw footage. Some of the other changes made, to the other episodes, are more contentious and irksome. I have no issue with correcting technical glitches (flaws caused by the inherent inadequacies of the video recordings, for example), but when the Team make changes to things that have become enshrined (and I choose the word advisedly) in Doctor Who lore, or are delightful errors that reward the attentive viewer, they go too far. I'm even opposed to digitally painting out boom microphones and boom shadows, where they creep into shot. Some of the Restoration Team's sound tweaks are so far-reaching that you have to wonder if the original warts-and-all audio recordings shouldn't be offered as an alternate track. Removing clicks and pops is all very well, but adding back fragments of dialogue lost because of a slow hand on the mixing desk, or removing "rostrum noise" (the noise of actors clomping about on wooden platforms), for me removes some of the programme's original charm. Arguably the most important bonus feature on this disc - indeed, in the whole set - is the Pilot Episode Studio Recording. Many changes were made between the recording of the Pilot and the remounted version, (the version eventually transmitted, on November the 23rd, 1963), many of them at the suggestion of the show's creator, Sydney Newman. The changes (which include softening the Doctor's abrasive attitude towards the two school teachers that enter his ship, and being less specific about the character's origins), are well-documented elsewhere, but it's still fascinating to compare the two versions for oneself. An option to watch them side by side (perhaps with the ability to toggle between the two audio tracks) would have been very interesting (there's a bit like this in Doctor Who: Origins documentary, of which more anon). Theme Music Video - a re-mastered presentation of the full-length version of the programme's original theme (written by Ron Grainer, and realised by Delia Derbyshire). A wonderful Dolby Digital 5.1 version remixed by Mark Ayres makes its debut here. There are also options to hear a 2.0 stereo version, and a mono version. 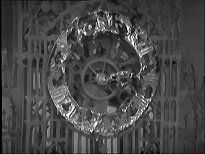 The music is set to images from the opening titles, the TARDIS take-off sequence from the end of the first episode, and material from the title sequence test footage. Comedy Sketches - There are four sketches here. Three star The League of Gentlemen's Mark Gatiss and Little Britain's David Walliams. These were produced for the BBC's Doctor Who Night, in the late 90s: The Pitch of Fear (sadly bereft of its funniest, most scathing line, at the request of its writer), The Web of Caves and The Kidnappers. The fourth, The Corridor Sketch, which features a few familiar faces from the early days of organised fandom, was produced in 1991 by Reeltime Pictures. Among its cast is Nick Briggs, who provided the Dalek and Nestene voices for the new series of Doctor Who. There are three episodes with commentary tracks: the Pilot Episode Studio Recording (by Producer Verity Lambert and Director Waris Hussein); the first episode (by Verity Lambert, and actors Carole Ann Ford and William Russell); and on the fourth episode (by Carole Ann Ford, William Russell and Waris Hussein). The contributors are occasionally a little vague on details - understandable, considering that the programme was made more than forty years ago! - but there is plenty of substance. Reminiscences are teased out by moderator Gary Russell, who keeps things moving, and, more importantly, knows when to shut up and let other people speak: a skill not to be undervalued. One of the more interesting subjects discussed is the resistance that the production team encountered within the BBC to getting the show made (because of internal politics, and demarcation disputes between different departments). Having seven episodes on this disc has left little room for bonus features. Indeed, seven episodes is arguably more than will comfortably fit on a dual-layer disc, so any additional material on this disc is really pushing the limitations of the format. Creation of the Daleks is a tightly-focussed seventeen-minute nuts-and-bolts guide to how the Daleks were created, focussing on their design, their voices, and their operation on the studio. Contributors include The Daleks' director Richard Martin, designer Ray Cusick, Dalek operator Michael Summerton, and voice artiste David Graham. 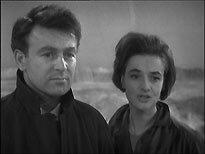 There are three episodes with commentary tracks: episode 2 (The Survivors, by producer Verity Lambert and director Christopher Barry), episode 4 (The Ambush, by Barry and actors William Russell and Carole Ann Ford) and episode 7 (The Rescue, by director Richard Martin and actors William Russell and Carole Ann Ford). Once again, things are kept bubbling along. Three episodes out of the seven is probably enough for most fans, but you get the impression that the guests wouldn't have run dry if they'd been asked to provide commentary for all of them. Doctor Who: Origins (54m) is an outstanding especially-created documentary, which, as the title suggests, charts the creation of the series. Once it gets past the usual 60s behind-the-scenes-at-the-BBC footage beloved of nostalgia programme makers for the last decade or two (Mother Courage, etc), and starts focussing in on Doctor Who specifically, it becomes quite fascinating. The background information it offers will be familiar to many fans (especially anyone who's read Howe-Walker-Stammers' superb The Handbook), but the documentary brings it to life. The depth of the research is evident on screen, as each point is illustrated by a suitable still, clip or document (most notably a 1984 interview with the series' creator, Sydney Newman). It's wonderful to be able to put faces to many of the legendary names behind the series. (Obviously, many of these are well-known to fans, but few would be able to summon up images of peripheral participants like Desmond Briscoe, or Joanna Spicer, for example). The highlight of the documentary is a sequence dealing with the creation of the show's title sequence, which is based around an interview with graphic designer Bernard Lodge. Terry Molloy provides the documentary's narration, although I dare say few people who know him from playing Davros (or, indeed, from The Archers) will recognise his perfectly-measured delivery here. As for whoever it was who provided the bizarrely-accented voice for Donald Baverstock, well, let's just agree never to mention it again! There are a few irritants, however. The first is the understandable decision to present almost the entire documentary in anamorphic 1.78:1 (16:9) format. This includes cropped clips from the series itself and, rather more disappointingly, the tantalising excerpts from Z-Cars (with Carole Ann Ford) and Maigret (two episodes, one featuring Richard Martin in his acting days, and another featuring Jacqueline Hill). It's also a shame that meaningful clips of the other cast members' other early roles weren't included. Clips of Hartnell in Granada TV's The Army Game (or This Sporting Life, the film role that is acknowledged as bringing him to the production team's attention, for that matter), and of William Russell starring role in the ITC adventure series The Adventures of Sir Lancelot, are conspicuously absent. I suppose you have to draw the line somewhere. Film clips from third parties are sometimes difficult, and often notoriously expensive, to license, and the budget for the bonus features for a Doctor Who disc isn't exhaustive. All credit to editor / associate producer Steve Broster, writer / producer Richard Molesworth, and executive producer Steve Roberts for an excellent documentary. Clips from the series are treated more sympathetically in Over The Edge - The Story of The Edge of Destruction (29m), the documentary about the series' third story. The Edge of Destruction was essentially a cost-saving exercise featuring just the four regular cast members, and, predominantly, the existing TARDIS control room set. Nevertheless, the two episodes mark a turning point for the series. The events of the story put the travellers through great mental anguish, and it's here that they begin to bond together. Contributors to this featurette include directors Frank Cox and Richard Martin (who handled one episode apiece), Carole Ann Ford, William Russell and Verity Lambert. Rather surprisingly, there are also contributions from old school Doctor Who fandom luminaries, like Keith Barnfather, Richard Landen, and Jeremy Bentham. Aesthetic considerations aside, Inside The Spaceship - The Story of the TARDIS (10m) plays like an addendum to the Over The Edge documentary. It's a relatively straightforward look at the design and use of the TARDIS interior, specifically it's use in The Edge of Destruction. Masters of Sound (12m). This documentary draws on unseen material prepared for the 1993 documentary Thirty Years In The TARDIS, which may explain why, unlike the other bonus features, it's in 4:3 format. It also contains extracts from a 1968 programme, Tom-Tom and, apparently, a fascinating-looking programme called Master of the Signature Tune, about Ron Grainer, which unfortunately pre-dates Doctor Who by six months. The result is a bit of a potpourri, with the best comments, from the delightfully dotty Delia Derbyshire, saved for last. For some reason the Doctor Who clips used in this featurette are incredibly grotty: they're certainly in sharp contrast to the lovingly-restored prints used for the DVD! It would have been very nice to see Tom-Tom (and Masters of the Signature Tune, if it does indeed still exist), in their entirety. This is a regular frustration of the Doctor Who DVD range. I can't be the only person who wants to see these programmes intact (as well as excerpted in the newly-made documentaries). Marco Polo was the fourth Doctor Who story: a lavish costume drama epic set in ancient China. Sadly, the original recordings are lost, and only the audio tracks, off-monitor photo's ("telesnaps") and photographs taken on-set survive. These have been used to create a thirty-minute condensed version of the story, in similar fashion to the unofficial "Reconstructions" that circulate among fans. In lieu of the episodes themselves, this is a good representation of the story (although severely edited - the original version was seven times as long!) A complete reconstruction of all seven episodes would, of course, have required a disc of its own! It's well worth having the Marco Polo reconstruction as part of this set, as it bridges the gap between The Edge of Destruction, and the next story, The Keys of Marinus, which, fortunately, survives, and will, no doubt, be released on DVD before too long. Gallery - a five-minute slideshow of photo's from The Edge of Destruction (only a handful exist), and Marco Polo (a great many exist, many of them in colour!) These are, as usual, set to a suite of sound effects from the stories concerned. PDF Documents - a gallery of Radio Times cuttings (including the Marco Polo cover), and the script for the first episode of An Unearthly Child. Both are nice additions to the set. It's disappointing that the set does not include all the fascinating memos and documents seen in the Origins documentary, which are generally only accessible by academic researchers. Some of them can be read if you use the pause button, but others are more elusive. Arabic Soundtrack - episode two of the story offers the option of listening to the Arabic dubbed version. You can select it from the Audio Options menu, or toggle between the two tracks manually. Few episodes exist with their contemporaneous foreign soundtracks, so including this was definitely worthwhile. Sadly there wasn't room in this set for another episode's foreign audio track: the Spanish version of The Rescue (the final episode of The Daleks). It's hard to believe that space couldn't have been found for a single mono audio track, which surely wouldn't have taken up much room. A tweak here, a tweak there... It's frustrating because it's a case of "if not now, when?" There probably won't be another suitable opportunity to use it on another DVD. All thirteen episodes in the set have optional Information Text subtitles, offering a stream of interesting trivia and information. As usual, these are meticulously researched, and well worth reading. Breaking with tradition, there are no Easter Eggs on this set, so don't bother looking! Doctor Who - The Beginning is a wonderful collection of classic Doctor Who episodes. At the time of writing, the set was available to order for less than eighteen pounds, which makes it a genuine bargain. The thirteen episodes look and sound better now than they ever have before, thanks to the stalwart work of the Doctor Who Restoration Team. The bonus material on offer is bountiful, but tightly focussed. It builds a fascinating picture of how the series was gestated and realised. Indeed, even if you weren't a Doctor Who fan, the Origins documentary provides a fascinating insight into how BBC TV drama was created in the early 60s. Overall, Doctor Who - The Beginning is magnificent effort by all concerned. - The actual titles of these stories included in this set have been a vexatious point of discussion for Doctor Who fans for many years. From the show's launch, throughout most of William Hartnell's sojourn as the Doctor, each week's episode had a unique title. These were published in the Radio Times, and were the only titles made available to the public. For many years the overall title of each group of episodes (what we now generally refer to as "a story" or "an adventure") wasn't generally known outside the BBC. This rather lax attitude manifests itself in the surviving internal documents, which often refer to each story by whatever title was commonly in use at that time. Different departments settled on different titles. In fact, it doesn't seem that anyone decided to sit down and formalise things until 1965! 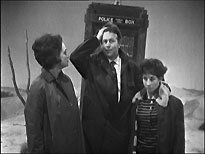 Fans of the show had to wait until the publication, in 1973, of the tenth anniversary Radio Times Special to discover what the early stories were called, and that only confused the situation by simply adopting the title of a story's first episode as the overall title (hence the use of An Unearthly Child to refer to a four-part story, when only the first episode is actually about an unearthly child). The net result of this is that many of the 1963-1966 stories are known by more than one title. The titles used for this DVD set are generally accepted as the "official" BBC titles, and are widely used, even though they may not be the most descriptive, or ones that the show's original creators intended, or, indeed, would even necessarily recognise!